The 2012 Achelo is a very balanced wine with delicate aromas which range from white peaches to pineapple. On the palate it is well structured, with soft tannins and a tasty vein of acidity which adds savor to the flavors. The finish and aftertaste are long and supple. After a rainy but not particularly cold winter, normal spring weather guaranteed an excellent flowering and fruit set, but the initial part of summer was cooler than average. An abrupt rise in temperatures arrived in mid-August, however, and continued until September 17th, and the heat wave was also marked by the absence of the cooler evenings and nights which normally characterize this period. Ripening of precocious varieties such as Merlot was delayed, while other varieties have been able to complete their maturation cycle once restored the normal parameters of the season.The wines produced are characterized by a good structure and balanced aromas. 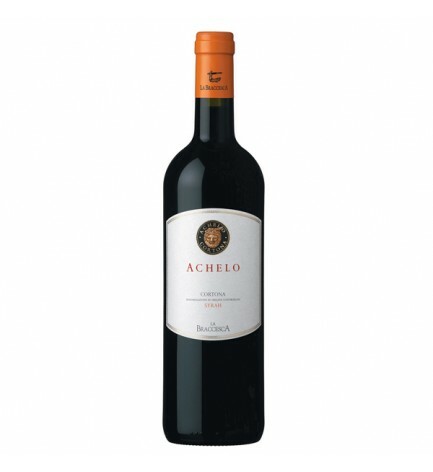 The Syrah grapes of the vineyard plots used for Achelo were picked around mid-September. After destemming and pressing the grapes were macerated for 4 days at least 10 degrees. After that temperatures reduced to 25 degree in order to exalt the tannins gentle extraction of the grapes. After 6 days, 70% of the wine went into barrel where it went through the malolactic fermentation. The remaining 30% was aged in stainless steel tanks. The La Braccesca farm, which extends extends over a total surface area of 420 hectares (approximately 1037 acres), is composed of two separate blocks: the historic nucleus of the property near Montepulciano, with 103 hectares (some 254 acres) of vineyards, and a second block, with 162 hectares (approximately 400 acres) of vineyards, at the foot of the hills of Cortona.